Big shoutout to the team over at Abstrakt Vape Co. I was just informed that they’re celebrating their 4-Year Anniversary! Well done. As a treat for all their loyal customers, they’re running 3 special deals this week. 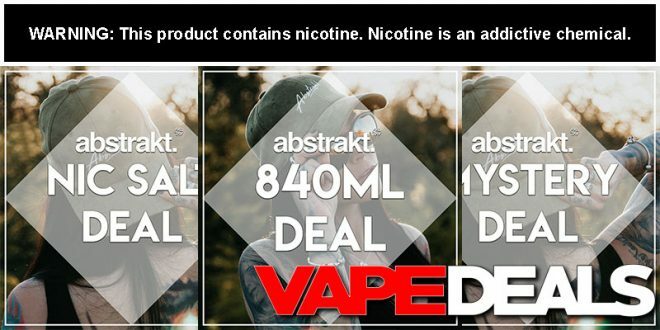 First of all, they’ve got a massive 840mL e-liquid bundle available for only $49! Secondly, you can get 2 flavors from their nic salt line AND a mystery hardware item for only $19.99. And lastly, you could pick up a mystery 120mL for $5.99 (limit of 4 per customer). No coupon codes are required, which means you could take advantage of all 3 of these deals if you wanted. Just keep in mind that this sale officially ends on Saturday (4/20). Shipping is FREE when you spend $50 or more.